The last Mixed Doubles competition of the season The Kennish Cup was held on Saturday with the competition postponed at the end of July due to poor weather. The competition still managed to attract 24 pairs. 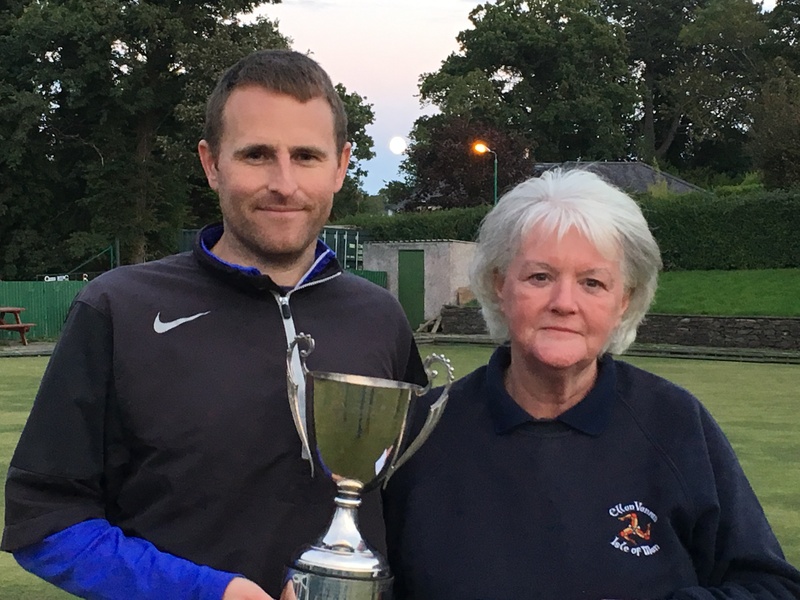 The winners were the home pairing of Elaine Moore & Glynn Hargraves who beat Chris Price (Port St Mary) & Dave ‘Dido’ Kelly 21-19 in the final. The game was close throughout with both pairs taking some good counting bowls off their opponents throughout with neither pair able to break away from the other until the last few ends. With the score standing at 15-14 to Moore & Hargraves they conceded a four and a single to fall 15-19 behind. From there Moore & Hargraves dug deep to take three consecutive singles and counting with three good bowls on the final end to secure the title with a 21-19 win. Losing semi-finalists were the two home pairings of Fiona Kennish and Steven Waters to the eventual winners (8-21), whilst Kim Hargraves and Stefan Kelly lost out 10-21 to the runners up. Losing out at the quarter final stage were new bowlers Sue and Geoff Collier (South Ramsey) who only took the game up in June, Lil Smith (Marown) and Edward Carlyle (Onchan), Caroline and Steve Parker along with Janet Monk and Rob Monk (all North Ramsey). The presentation was made by competition secretary John Kennish on behalf of the Kennish family who sponsored the competition, with thanks given to everyone who had helped with the running of the competition, the ladies for once again putting on a fantastic selection of refreshments throughout the afternoon, and the green keepers for preparing the green.